Dorothy Sophia Herrmann, 90, of Glencoe, died Friday, Jan. 19, 2018, at Grand Meadows Senior Living in Glencoe. Funeral services will be held Saturday, Jan. 27, at 11 a.m., at Friedens (County Line) Church in rural Norwood Young America, with the Rev. Matthew Orendorff officiating. Honorary casket bearers will be Thomas Lawson, Michael Lysse, Tinsley Sophia Lawson, Nora Michelle Lysse and Sawyer Joel David Lysse. Casket bearers will be Jodie Herrmann Lawson, Jessica Herrmann Lysse, Dale Hoof, Scott Hoof, Kevin Hoof and Lori Fabel. Interment will be in the Ferguson Cemetery in rural Norwood Young America. Dorothy Sophia Herrmann was born Sept. 30, 1927, at home near Plato, to Herman and Hulda (Hoernemann) Hoof. She was baptized as an infant in October 1927, and was confirmed in her faith as a youth in May 1941, both at Friedens (County Line) Church in rural Norwood Young America. She received her education in Glencoe, graduating from Stevens Seminary with the class of 1946. On May 27, 1949, she was united in marriage to Delmer Herrmann at Friedens (County Line) Church. They made their home on their farm near Plato, and shared over 68 years of marriage. In addition to working on the dairy farm, Mrs. Herrmann also worked at Sears, Pinske Lumber, Green Giant, Edward Jones and MidCountry Bank. She had a knack for accounting and maintaining the books. She also volunteered as a coordinator for the Red Cross. 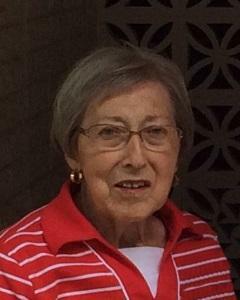 She has been a lifelong member of Friedens (County Line) Church and a devoted servant of the United Church of Christ, where she held numerous leadership roles and served as UCC Board member for the Eastern Association council. She also was the church organist for 60 years, and took pride in maintaining the organ so the church could enjoy the music as she did. In her free time, Mrs. Herrmann was an ambitious master seamstress. She also enjoyed quilting, cross stitching, flowers, playing cards and traveling. Friends and family treasured her because she had firm convictions and always spoke her mind. She lived a life of service to her family, community, church and, most importantly, to her Lord and Savior, Jesus Christ. All her works on this earth were a display of Jesus’ love to those around her. She is survived by her husband, Delmer Herrmann of Glencoe; son, Joel (Shirley) Herrmann of High Point, North Carolina; grandchildren, Jodie Herrmann (Thomas) Lawson of Charlotte, North Carolina, and Jessica Herrmann (Michael) Lysse of Greensboro, North Carolina; great-grandchildren, Nora Michelle Lysse, Sawyer Joel David Lysse and Tinsley Sophia Lawson; sister-in-law, Priscilla Hoof; nieces, nephews, other relatives and many friends. She was preceded in death by her parents, Herman and Hulda Hoof; and brother, Hilary Hoof. In lieu of flowers, memorials are preferred to Ferguson Cemetery or Friedens Church, c/o 11325 Zebra Ave., Norwood Young America MN, 55368. Arrangements are with the Johnson-McBride Funeral Chapel in Glencoe. Online obituaries and guest book are available at www.mcbridechapel.com.